This is the first post of my animal series. I have two completed and I wanted to share them. This category will not be updated very often as it seems to take me a long time to complete all mosaics other than the 4 inch square I create each day. I asked my friends which animals they feel close to, totem animals, teachers, etc and it started from there. The first one is the Fox. To start this project I printed out a bunch of pictures of animals. 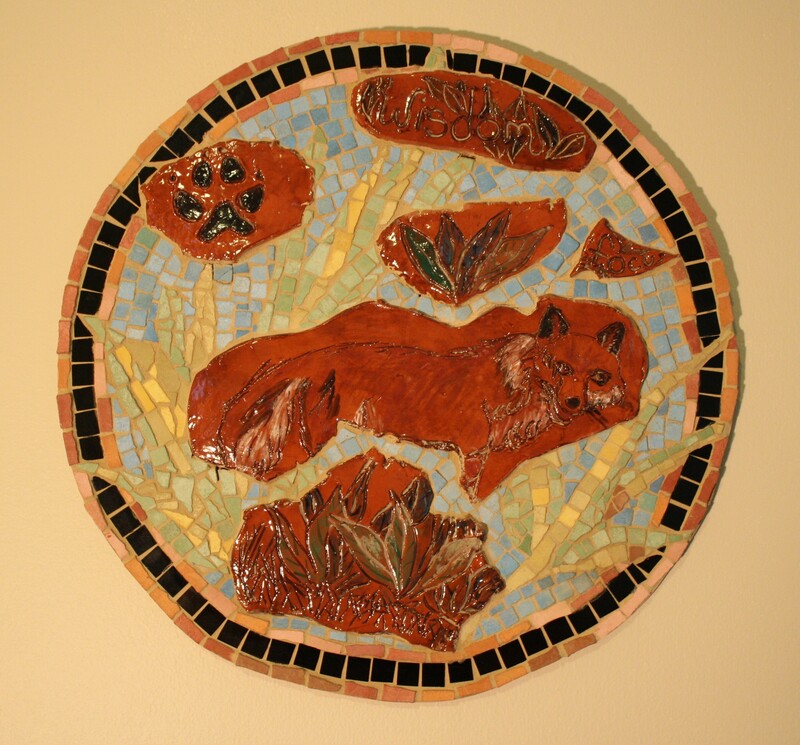 When I got to mosaics class the fox was on top and I felt like he needed to be the first one even though none of my friends mentioned the fox. I guess he wanted to be seen and heard anyway. I’m good with that. I made the fox and other pieces using red clay. I drew the shapes on the clay and then cut them out. 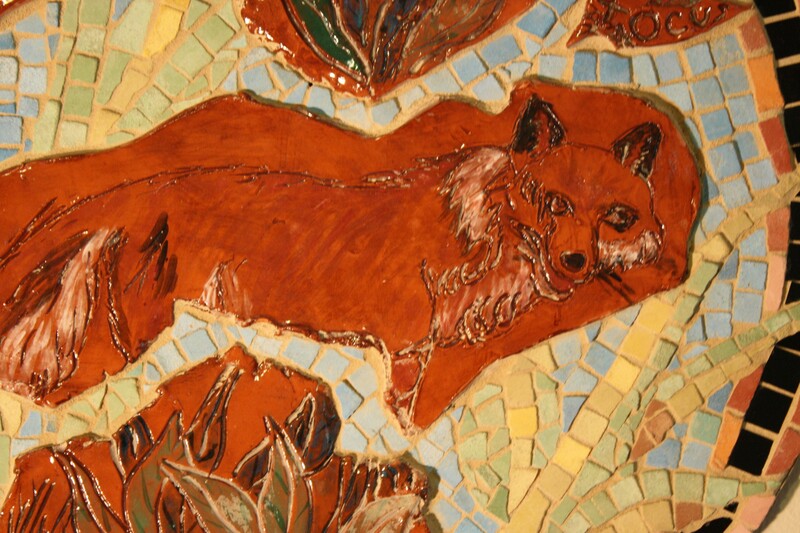 I then painted the fox features and details with glaze. I think it looks like pieces of pottery found in an archeological dig. I added the background plants using purchased clay tiles. I like the contrast of the shiney red clay pieces and the flat finish of the background. The words on this piece are Wisdom and Focus. Next came the Polar Bear. I created him the same way as the Fox – I drew him in the clay (this time white clay) and then painted him with glaze. I made a stamp of the footprints and stamped it in the clay tiles. I made the background by painting the “snow” on the board and then covering it with broken pieces of textred clear glass. His message is “It may look like I’m walking on thin ice but I know I’m safe and that I’m always protected and cared for. I know it so deeply in my soul that I don’t ever have to think about it. It just is” I think about his message often and I love to share it. Pictures don’t do justice to this polar bear. He looks so much better in person! I love it! 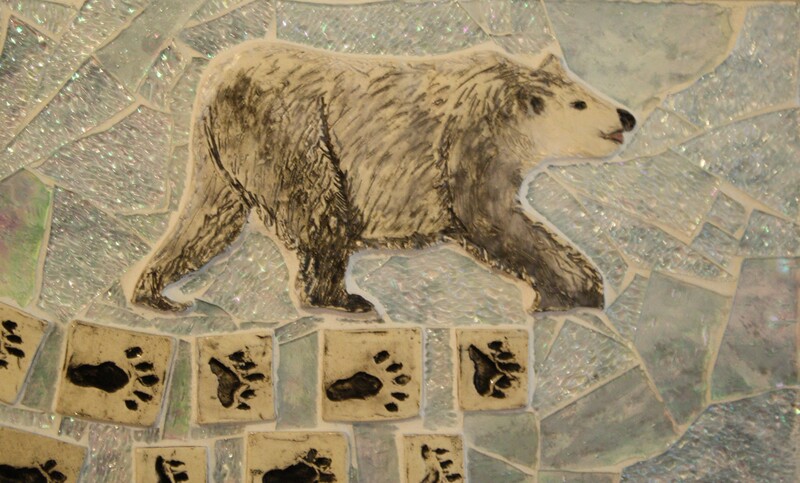 I love the polar bear mosaic. It’s truly exceptional. Hi Judy, checking in and feeling your messages from the animals… just wonderful… thank you for sharing your gifts!! Thanks, I’ll be posting more animals in August. stay tuned!